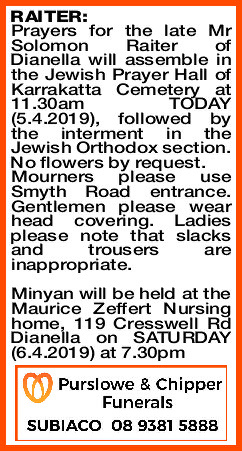 Prayers for the late Mr Solomon Raiter of Dianella will assemble in the Jewish Prayer Hall of Karrakatta Cemetery at 11.30am TODAY (5.4.2019), followed by the interment in the Jewish Orthodox section. Mourners please use Smyth Road entrance. Gentlemen please wear head covering. Ladies please note that slacks and trousers are inappropriate. 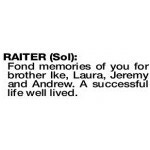 RAITER SOL Fond memories of you for brother Ike, Laura, Jeremy and Andrew. A successful life well lived.